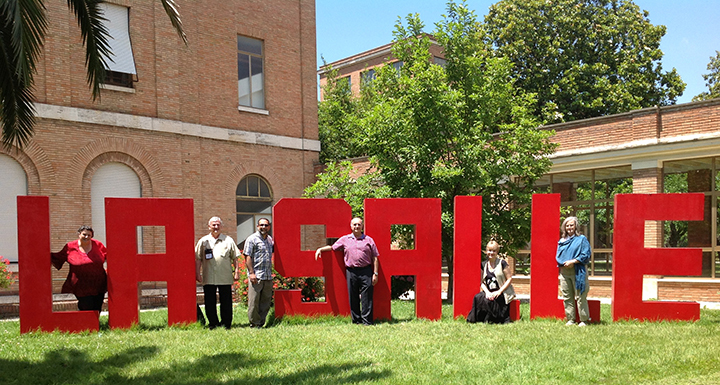 Representatives from 27 Lasallian higher education institutions in seven countries gathered in Rome in June for the seventh annual International Association of Lasallian Universities (IALU) Leadership program. Of the 58 participants, 19 were from the Lasallian Region of North America (RELAN) and included representatives from each college and university in the Region. The gathering helped participants develop a deeper understanding of the role of a Lasallian university and the nature of the worldwide network of Lasallian higher education institutions. Participants shared ideas, challenges and opportunities that face higher education. For most participants, the next step will be sharing their new understandings of the depth and breadth of the shared mission on their home campuses. Several international collaborative program proposals will also be explored. The leadership program is the result of the Buttimer Institute of Lasallian Studies project of John Wilcox, Ph.D. professor emeritus of theology at Manhattan College in Riverdale, NY. It is directed by Roxanne Eubank, Ed.D, Director of the Institute for Lasallian studies at Saint Mary’s University of Minnesota in Winona. Bylaws for IALU were approved in 2012 which formalized the longtime, unofficial collaboration between Lasallian colleges and universities.